So far I’ve looked at a couple of primes and now I’m going to turn my attention to a standard zoom, the Olympus OM Zuiko 35-105mm f3.5-f4.5. As good as the day I bought it which was in 1983. Introduced in 1983, which is when I bought my copy. 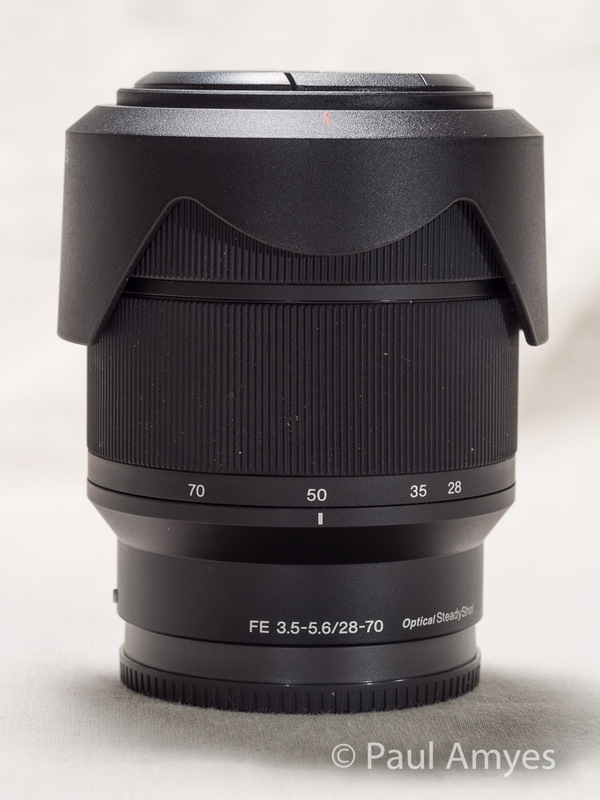 This lens was often rumoured to have been designed and made by Tokina, but this has been refuted online and it would appear that it differs significantly enough that it can be until otherwise proven an Olympus lens. 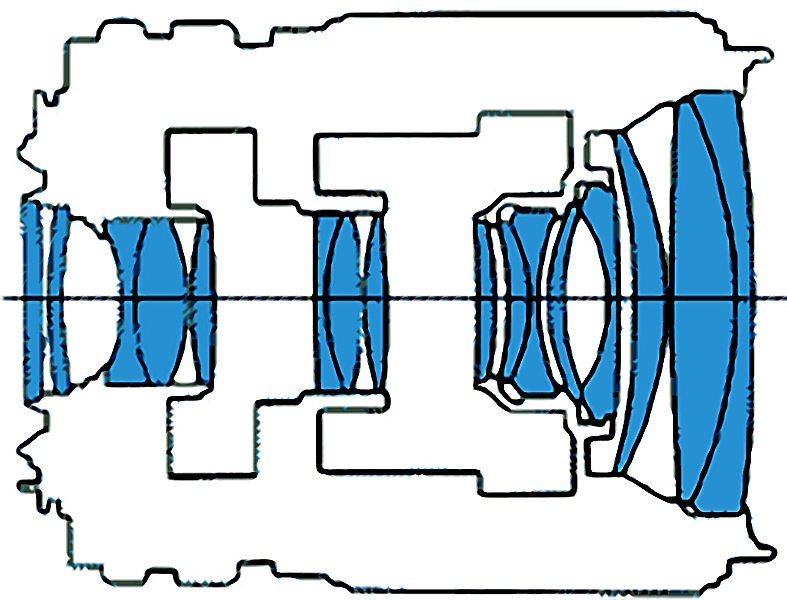 Schematic of the Olympus OM Zuiko 35-105mm f3.5-f4.5 showing the lens elements in their various groups. Over its production cycle there were two variants produced. The first version, which is the one I have, with serial numbers below 500,000 weighs in at 460g, is 116mm fully extended (in macro mode) and 86mm retracted, the rubber focusing grip is 42mm wide, and there is and Infra Red (IR) focusing mark above the aperture ring. The rear lens element is flat and flush with the back of the lens.The second version (serial numbers above 500,000) is 470g in weight, 87mm long retracted, and the focus grip is 38mm wide. There is no IR focus mark, but there is a white variable aperture dot between 3.5 and 5.6 on the aperture ring. The rear lens element is recessed and convex. The construction of the lens is that of a one touch zoom design with a built in close focus mechanism which allows a minimum focus distance of 31cm with a maximum reproduction ratio of 1:5. There are sixteen lens elements in twelve groups and the filter thread is 55mm. The variable aperture was a design compromise to keep weight and size down, it provides a reasonably bright f/3.5 at the wide-angle setting but gradually stopped down to a dimmer f/4.5 when reaches the telephoto range. The big disadvantage is the rate at which the aperture varies through the range and this convinced me of the practicality of using TTL flash back in my days of shooting transparency with OM cameras. Olympus OM Zuiko 35-105mm f3.5-4.5. 35mm at f8. 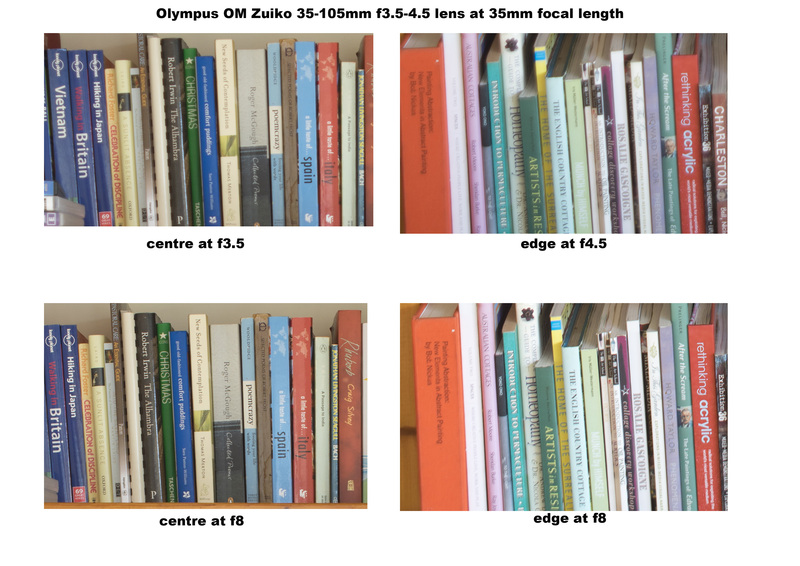 Comparison chart of the Olympus OM Zuiko 35-105mm f3.5-f4.5 shot at 35mm focal length wide open and then at f8. 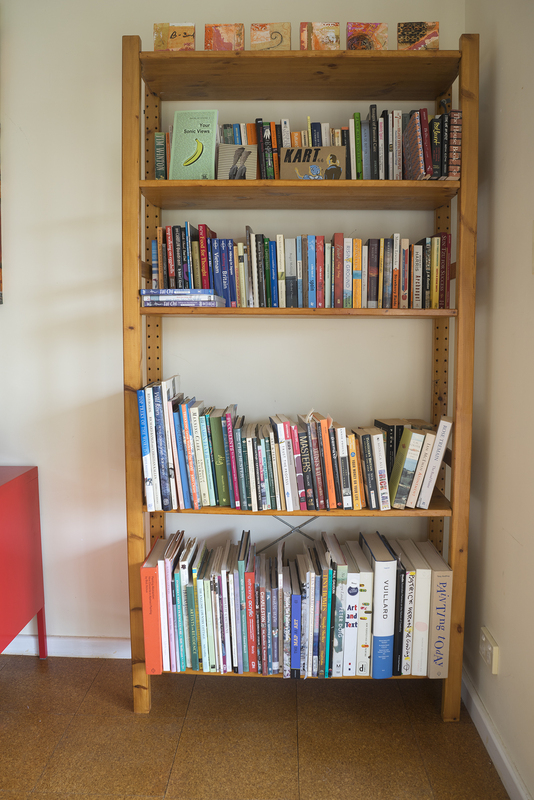 At the 35mm end the lens is remarkably free of distortion. Wide open the CA is very apparent, but this is easily corrected in post. The centre of the test image not crisply sharp and is also lacking in contrast which adds to the impression of softness. Bumping up the contrast in post improves things greatly. I never questioned the sharpness of this lens when shooting film – hardly surprising when you consider I most shot Fuji Chrome Velvia 50 or Kodachrome 25 or 64 all of which are high contrast films. At f8 the centre sharpness increases nicely but the edges are still soft and lacking contrast. Olympus OM Zuiko 35-105mm f3.5-4.5. 105 at f8. 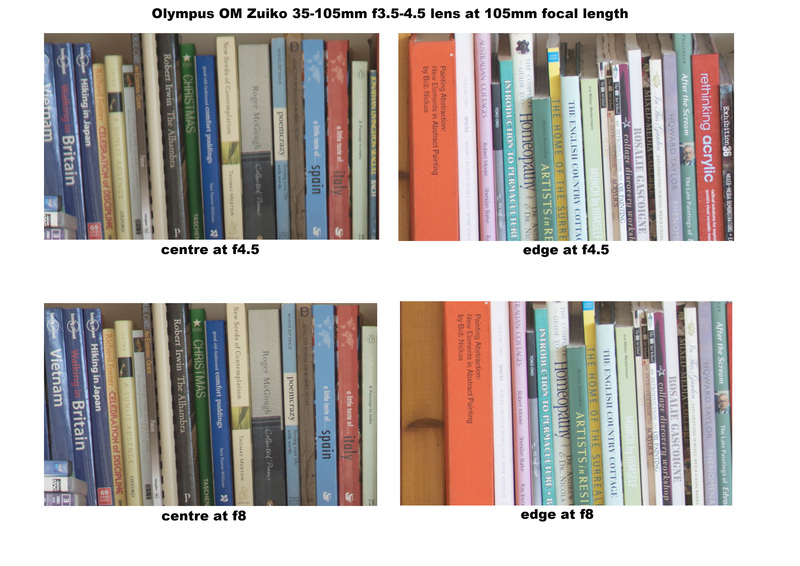 Comparison chart of the Olympus OM Zuiko 35-105mm f3.5-f4.5 shot at 105mm focal length wide open and then at f8. At 105mm the lens exhibits a slight pincushion effect. This is where image magnification increases with distance from the optical axis and parallel lines bow inwards like a pincushion. This is not uncommon in this type of lens at the long end. Wide open at f4.5 the image is soft and lacking in contrast at the centre and the edges are even worse. By f8 the centre of the image has improved a little but the edges have not. CA is present but again is easily dealt with. Back in the day this was my go to lens – I shot nearly everything on it and I thought it was great. Here are some examples of it from the early 1980’s shot on film and scanned. Beccah and Jane sitting on the back step at Molecomb Cottage, Goodwood, West Sussex. June 1985. Helen, Chichester, West Sussex. September 1985. Paradise Video-Music Pub, Thira, Santorini, Greece. So lets see how it does on the Sony A7r. Balloons in the window. York, Western Australia. Olympus OM Zuiko 35-105mm f3.5-4.5. Overall the lens lacks the contrast present in the other OM lenses. The bokeh is somewhat swirly though not as obvious as that exhibited by the Helios 58mm f/2 lens and is what some might call a little nervous. Wide open this lens is very prone to vignetting and filter users will have to be aware of this. Now zoom lens from this era have a bad rap for poor image quality so I thought that it would be interesting to compare this lens with a modern standard zoom – namely the Sony FE 28-70mm F3.5-5.6 OSS. Some people might find this an unfair comparison comparing a cheap kit lens with a premium quality zoom lens, but there is over thirty years separating them and lens design has come on a long way in that time especially in regard to zooms. The most obvious thing that comes to mind when comparing the two lenses is the build quality – compared to the Olympus 35-105 the Sony feels like it came out of a Christmas cracker. It feels very cheap and plasticky and quite honestly it doesn’t feel very durable at all. In fact the word “disposable” comes to mind when handling it and I don’t think we’ll see many working copies of this lens around in thirty years time. 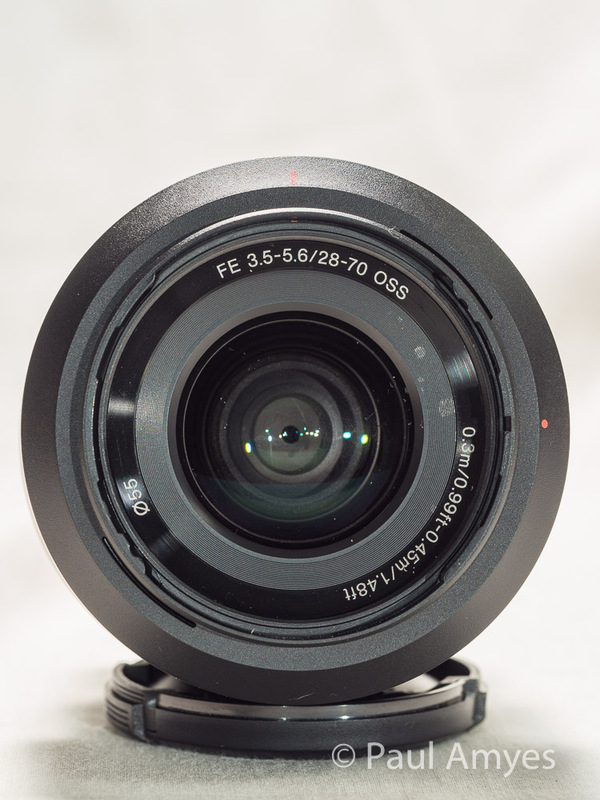 Sony 28-70mm f3.5-5.6 OSS. 28mm at f8. 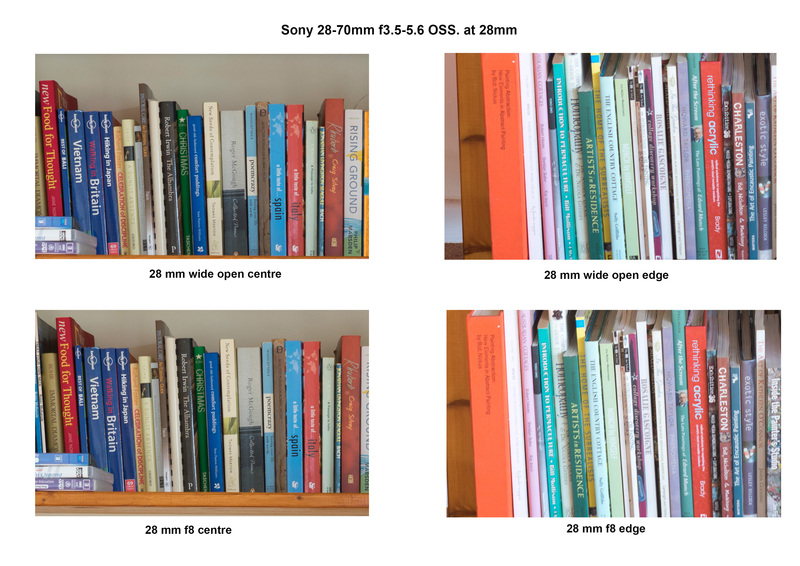 Sony FE 28-70mm F3.5-5.6 OSS at 28mm comparing the centre and the edges of the frame at f3.5 and f8. So having looked at the test shots what can we say? Well wide open at 28mm the centre the lens is sharp and contrasty and amazingly it improves considerably when stopped down to f8. At the edges wide open there is a significant drop off of sharpness and contrast and this only improves slightly when stopping down to f8. Distortion and chromatic aberration are automatically corrected in camera. 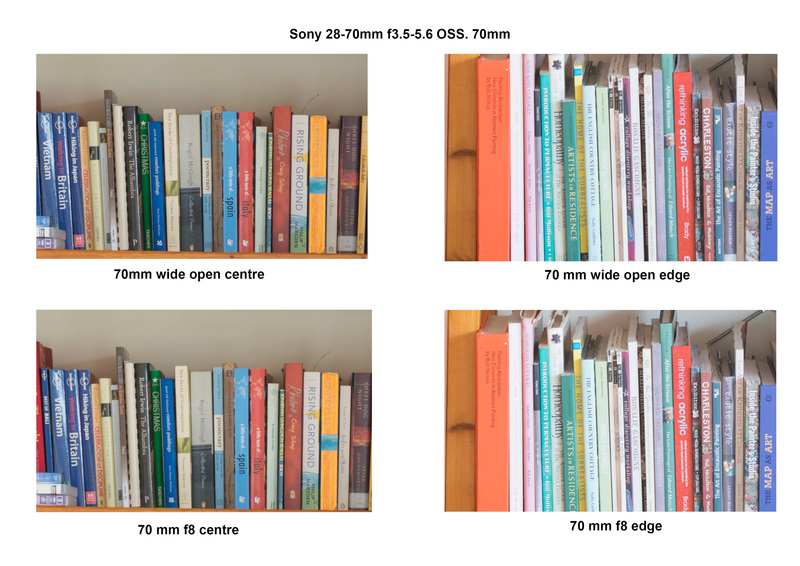 At 70mm wide open in the centre the lens is a little soft and flat with hardly improvement when stopping down to f8. At the edges it is much the same story. 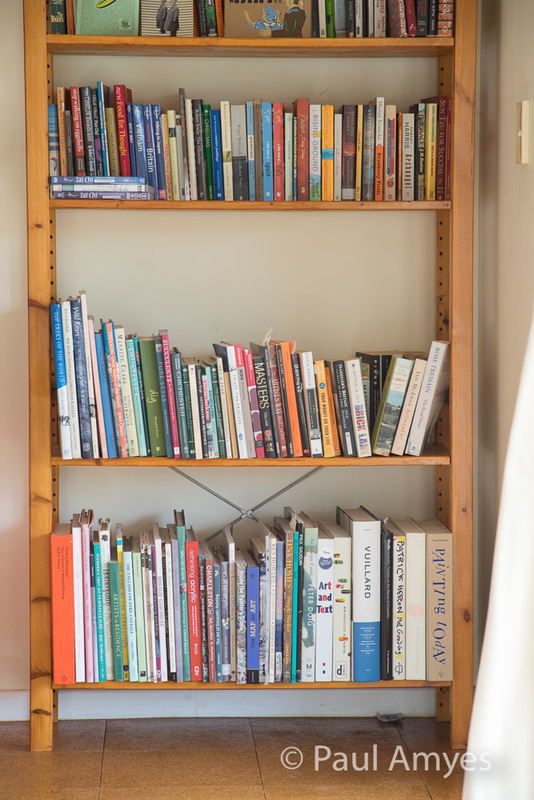 The only real advantage this lens has over the Olympus is the automatic lens profiles that correct CA and distortion and the lens coatings are marginally better all of which can be overcome with a little fiddling around in Lightroom. The Sony sells for around $350 AUD at the moment while the Olympus can be picked up for less than $100 AUD on EBay. What is more worrying is that according to DXO the Sony FE Carl Zeiss Vario-Tessar T* 24-70mm F4 ZA OSS which is priced at around $1500 AUD is not significantly better than its cheaper sibling and coupled with accounts of substantial sample variation just doesn’t seem to have endeared it to Sony Alpha users. All this makes the Olympus OM Zuiko 35-105mm f3.5-4.5 seem like a screaming bargain if you don’t mind having a manual focus lens as your walk about kit. My reviews of the Olympus OM Zuiko MC 24mm f2.8 and the Olympus OM Zuiko MC 50mm f1.4 can be seen by clicking on the links. Posted in equipment, photography	adapted lensequipmentFotodiox Lens Mount Adapterlegacy lensOlympusOlympus OM Zuiko 35-105mm f3.5-f4.5Paul AmyesphotographySony 24-70mm f/4 Vario-Tessar T* FE OSSSony A7rSony FE 28-70mm F3.5-5.6 OSS lens.